Widney Manor Cemetery. Picture by Geograph. 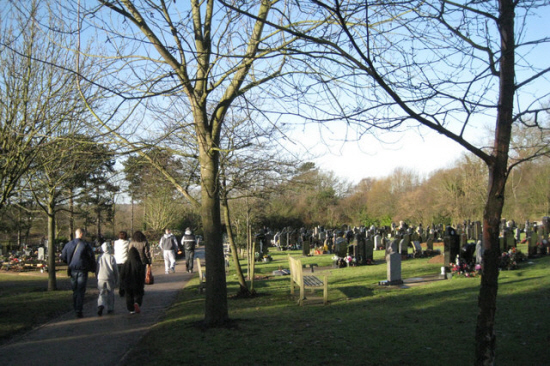 ALCOHOL could be banned from Solihull cemeteries after tributes were taken from graves. Solihull Council’s Stronger Communities and Partnerships committee is being recommended to exclude alcohol from being taken in, left or drank across the Solihull’s cemeteries and crematoriums ahead of a meeting on Wednesday (January 30). A report by Julie Williams, operational support manager, bereavement services, says anti-social behaviour has taken various forms – from theft of flowers and lanterns from graves to threat of physical violence to one of the grounds staff. It notes there has also been an increase in visitors ‘having a drink’ with their deceased loved ones and leaving alcohol on graves when they leave, creating a risk of alcohol falling into the possession of vulnerable people including children. Solihull Council owns and manages Woodlands Cemetery and Crematorium in Coleshill, Robin Hood Cemetery and Crematorium, Shirley, and Widney Manor Cemetery, Bentley Heath. It adds: “In recent years there has been an increase in anti-social behaviour linked to the use of alcohol in our cemeteries and crematoriums. The council is working with the police an Friends of Woodlands Charity to see how it can resolve these issues, the report says. Staff carry personal alarms and the police have advised to ban alcohol to change behaviour, it adds. According to the report, police are also carrying out plain clothes patrols on an ad hoc basis at Woodlands Cemetery which is the venue experiencing much of the anti social behaviour described.